In ‘A people’s history of the vampire uprising’, Raymond A Villareal has undertaken to bring a new spin to this genre by recreating the vampire myth. The time is now, Taylor Swift and Justin Bieber are still selling music and down in New Mexico a new disease has emerged where people like to drink blood and shun the sunlight. First on the ground to examine this new disease is Lauren Scott from the CDC, who tries to prod the Government into action and discover the source of the virus. Partnering up with Hector, a law enforcement official, they quickly begin to realise the scope of what is occurring. As the disease spreads the impact reverberates across society. The vampires quickly organise themselves to seek legitimacy as a species. They undertake a re-branding exercise to become gloamings, go all out on a publicity blitz by seeking equal rights and ensure re-creation is highly selective. Opposition comes from concerned community member, law enforcement and a religious sect that undertakes to eradicate the gloamings. There is no traditional narrative coursing through this book and no real central protagonist, but Lauren is probably the closest to that traditional tag. There are several other major players, who weave through the book and provide further context to what is happening. For some readers not being purely a character driven story may be difficult to adjust to as the history of the uprising is told through a mixture of first-hand accounts, media articles, interviews, legal decisions and government documentation. Villareal has done an outstanding job in creating a rich detailed world that oozes authenticity. You could easily believe that this event is actually happening. The scientific, legal papers, interview transcripts and news articles add to the realism and are well researched and planned out. The writing is highly descriptive and allows you to immerse into the different locations and times. The characters are all well developed and have their own traits and foibles. There is a great of complexity on the differing political and religious views as to the value and negative impact gloamings have on society. Are they a positive force assisting with development or are they behind an increase in crime and lawfulness? The strength and the weakness in this book is the level of detail. I mean Villareal must have created some in-depth character sheets. I know this because at one point a character remembers as he walks into a bar how his Dad had brought the exact same jukebox from a junkyard in Chicago. It may be interesting to know but it did not drive the story forward. There are other moments like this where layers of detail keep coming and it does slow the momentum down. The court case documents is another example where less would be good. You have to give Villareal credit he has created a richly detailed historical account in modern times of how vampires sought integration into mainstream society. He has mixed in conspiracies and questioned what tolerance is by giving us a world that leaps of the page with realism. 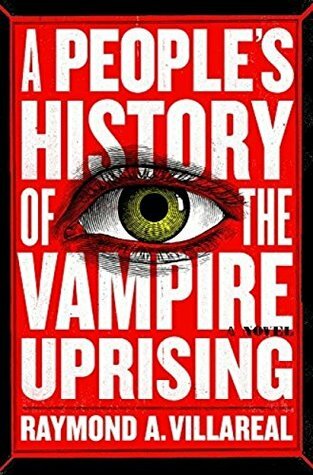 ‘A people’s history of the vampire uprising’ works because of the uncertainty of what and who is good or bad is this new world order. Villareal has given the vampire race back its dark roots, questionable morality and untrustworthy nature. I was provided a copy from NetGalley for an honest review.